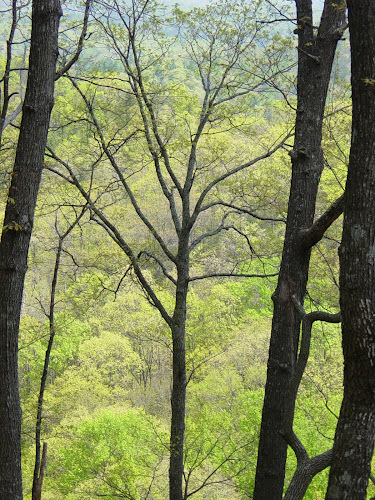 Winter woods are my favorite because you can see the ground, the old roads, the contours of what used to be fields. And you can see that even in the cold days of January, Springtime life is finding its way. A couple of years ago on New Year I walked the woods near the cabin, slipped and fell in the deep leaves. 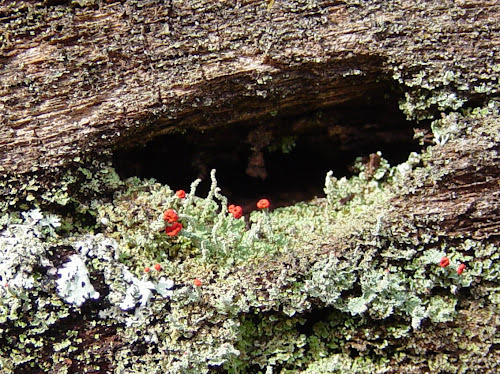 I noticed, laying there, tiny little red flowers growing up out of some moss on an old stump. They seemed outrageously out of sync with Winter, like bold red boots in a biker bar. Life works that way. This is a dreary and desperate time in public caught between strands of cynical incivility. I’m not sure which is worse, the candidates or Marines. But life pops up amid it all, patiently breaking through the drifts of waste. Last week I was honored to be included in a meeting of orthodox jews talking about how we could make Memphis a magnet for medical students, residents and faculty by carefully constructing “Sabbath friendly” residency programs. This mainly means scheduling so that the orthodox residents are not required to work between sundown friday and sundown saturday. That’s a lot trickier than you’d think, but is possible if everybody wants to figure it out. And we do. I love that a hospital with a seven story “Methodist” topped by a two story cross would would do that in collaboration with the University of Tennessee. So gloriously out of sync with the intolerant times! This week the Agency for Healthcare Research and Quality turned on the lights about what a tiny fraction of the population incur so much of the overall cost of healthcare: 10% of us account for nearly two thirds of all the cost. They (it should be “we”) run up about $24,000 each, while everyone else costs almost nothing. The costly 10% are sixty percent women, with the same percent under 65 and 80% white. Only one in five of the costly citizens remains in the category for two years in a row–they die or get their conditions under control. I don’t know why this is newsworthy. It is like saying that 1% of the cars on the road cause 90% of the repair bills (the ones that get into wrecks), or that the .1% of luxury cruises result in 99% of the deaths (the ones that run aground on rocks and flip on their sides). And really sick people cost more than people who aren’t. It is more helpful to know that year after year the same neighborhoods have the highest concentration of very costly–which is to say sick–people. Our hospital is interested in that kind of knowing for two reasons. Those neighborhoods are where a very large amount of care we provide is not paid for by anybody. And that is another way of saying they are places that need a lot of mercy usually as a last resort. Our friends in Camden New Jersey examined their data on most costly patients and it led them to large public housing sky-scrapers. Here in Memphis it leads us to streets with bad single homes, often broken up into duplexes. What kind of knowing would help us know how to do a better job at mercy. It is obvious that mercy delayed is mercy denied, or at least provided with far less quality that 21st century science permits. Especially when in these neighborhood are so dense with our congregations, we know somebody who knows them. Why wait for people to stumble into the emergency room in acute pain when we can pretty well guess what street they live on? The question is so out of synch with the cold times. Doesn’t everyone know there is not enough to go around, that we must distain the poor for being so inconveniently needy? Spring begins when a tendril starts to feel its way toward the sun. And it begins when a question of mercy starts to feel its way toward the light that data, logic and science sheds on the neighborhoods. You can feel Spring on the way.